Take your choice—there are a variety of markets every day in Paris, selling anything you could want, and then some! I love Paris markets (marchés). They are great opportunities to buy fresh produce, meats, fish, and of course cheese. But they also offer a glimpse into French life. The vendors vary from friendly to pushy to bored to wildly enthusiastic. And in amongst the food you'll also find clothing, household goods, and flowers. And don't forget about the famous Paris Flea Markets! By law, each arrondissement must have a market at least two days a week. Some of these are open air markets that travel from place to place, and there are also about a dozen covered markets that are open every day (minus a day off). Looking for organic produce? In France that's called bio, short for biologique. Many markets will include organic stalls, and there are also three strictly bio markets. Don't forget the flower markets, particularly on Île de la Cité and by the Church of the Madeleine. The large flower market on Île de la Cité (Marché aux Fleurs) is transformed to a bird market on Sundays. Some markets include restaurants or informal eating areas within their boundaries, while others will provide you with an abundant picnic. If you rent an apartment, market shopping can help you produce simple and nourishing meals at home, when you need a break from restaurant meals (and prices). If you're headed to nearby Versailles, try to arrange your visit on one of the market days there to see a beautiful large market. Paris markets are a true delight to the eyes and the stomach. Identifying local markets and market days is always one of the first things I do when I arrive in Paris. 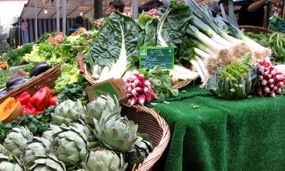 Above, Fresh organic produce at the organic Batignolles market. 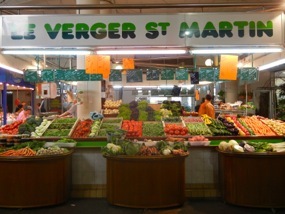 Below, Produce stall at the covered market St Martin, in the 10th arrondissement. 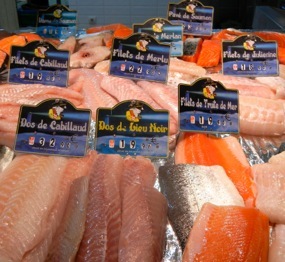 Above, A large variety of fresh fish at a Paris market.